Conversion of composite to RGB often loses information! One way to introduce color into images is to use a suitable LUT, as described in Images & pixels. However, then the fact that different colors could be involved in the display of such images was really only incidental: at each location in the image there was still only one channel, one pixel and one value. For images in which color is more intrinsic – that is, when the channel number is an extra dimension (see Dimensions) and we want to display channels superimposed on top of one another – things become more complex, because the precise color in the display for one location now depends upon a combination of multiple pixel values mixed together. We consider a &apos;true&apos; multichannel image here to be one in which the channel number is an extra dimension. Pixel values for each channel are often determined from light that has been filtered according to its wavelength. In principle, any LUT might be applied to each channel, but it makes sense to choose LUTs that somehow relate to the wavelength (i.e. color) of light detected for the corresponding channels. Channels can then be overlaid on top of one another, and their colors further merged for display (e.g. high values in green and red channels are shown as yellow). The important feature of these images is that the actual channel information is always retained, and so the original pixel values remain available. This means you can still extract channels or adjust their LUTs as needed. 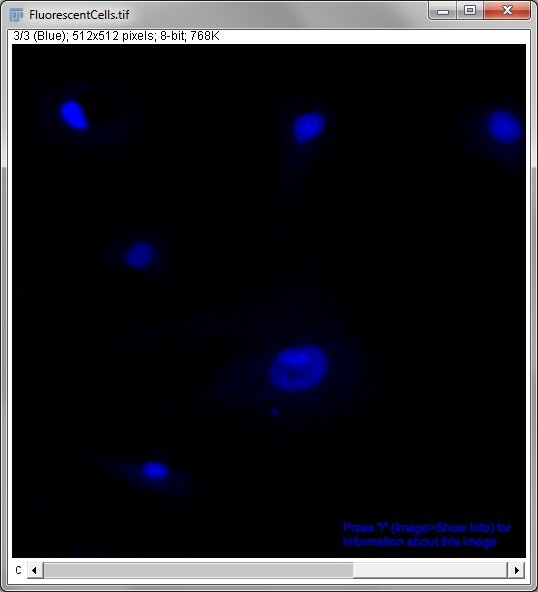 Figure 1: ImageJ composite image sample Fluorescent Cells. Using the Channels Tool…​ and the slider at the bottom of the window, you can view the channels individually or simultaneously. 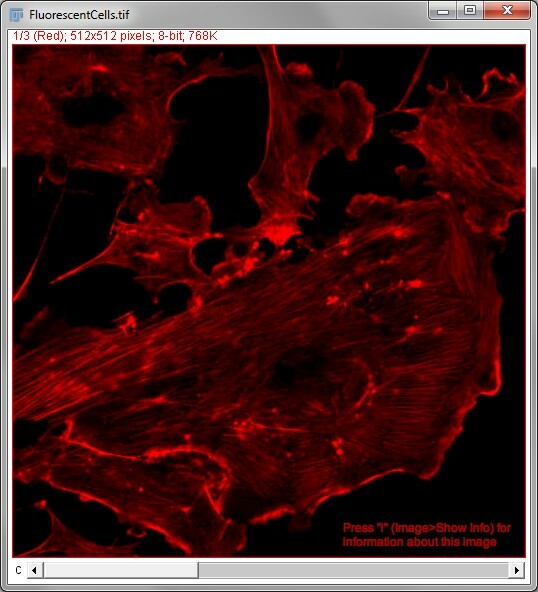 In ImageJ, such representations of multiple channels are sometimes known as composite images. An example can be opened by selecting File ▸ Open Samples ▸ Fluorescent Cells (400K) (Figure 1). As you move the slider at the bottom of the image, it might not look like much is happening. But if you also open the Brightness/Contrast…​ tool you can see that the color of the histogram changes for each slider position. Adjusting the contrast then adjusts it only for the current channel. This is very useful because quite different contrast settings can be required for each channel to get a decent final appearance. Also, as you move the mouse over the image the &apos;value&apos; shown in the status bar is the pixel value only for that channel. Composite images allow us to see multiple channels at the same time. But sometimes this masks information and it helps to look at each channel individually. One way to do this is to choose Image ▸ Color ▸ Split Channels, which will give you separate images for each channel. But a more powerful option is to select Image ▸ Color ▸ Channels Tool…​. 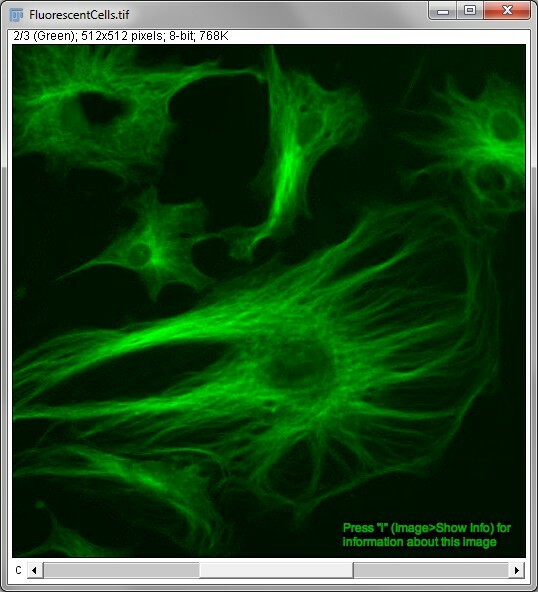 Using the Fluorescent Cells (400K) image, explore the use of the Channels Tool…​ until you are comfortable with what it does, including what happens when you click on the colors under More>>. How do composite images relate to the LUTs we described before? Try out some of the commands in Image ▸ Lookup Tables ▸ when investigating this. Each individual channel in a composite image is really just being shown with a LUT – most often one that is predominantly red, green or blue. The final displayed color results from mixing the channel colors together. Therefore, in principle any LUT might be used for each channel. But unconventional LUT choices can easily result in rather avant garde images that are difficult to interpret. Composite images can contain any number of channels, and these channels can have any of the bit-depths ImageJ supports (see Types & bit-depths) – so long as all channels have the same bit-depth. By contrast, RGB images invariably have 3 channels, and each channel is 8-bit. Furthermore, the channel colors in an RGB image are fixed to red, green and blue. This already makes clear that composite images can (at least potentially) contain much more information. However, the inflexibility of RGB images has one important advantage: compatibility. Computer monitors generate colors for display by mixing red, green and blue light. RGB images can dictate directly how much of each color should be used. This means that the values in each RGB channel really do determine the final image appearance, without any ambiguity regarding which LUTs should be applied because these are already known. Therefore all software can display RGB images in the same way. RGB images can be easily distinguished from composite images in ImageJ both because they do not have an additional slider at the bottom to move between channels, and because the text RGB appears at the top of the image window in place of the bit-depth. Also, moving the cursor over an RGB image leads to 3 numbers following the value label in the main status bar: the pixel values for each of the channels. Changing the brightness/contrast of an RGB image is also different. Making adjustments using the normal Brightness/Contrast…​ tool leads to the appearance of all 3 channels being affected simultaneously. Only composite images can therefore store more than three channels, or data with a bit-depth higher than 8. Consequently, if acquisition software provides the option to save data in an RGB format, this temptation should normally be resisted – unless you also save the image in the software manufacturer’s preferred, non-RGB format, and only use this latter version for analysis. The reason is that the conversion of a composite image to RGB can result in a significant loss of information, and if we only have the RGB version it may be impossible for us to say whether or not this loss has occurred. You can test the compatibility of composite and RGB images by opening File ▸ Open Samples ▸ HeLa Cells image, and saving it using File ▸ Save As ▸ Tiff…​ both before and after running Image ▸ Type ▸ RGB Color to convert the original 16-bit composite data to RGB. Try then opening both saved images in other software (e.g. Microsoft PowerPoint) and compare their appearance. Think of at least 2 ways in which converting a composite image to RGB can lose information. 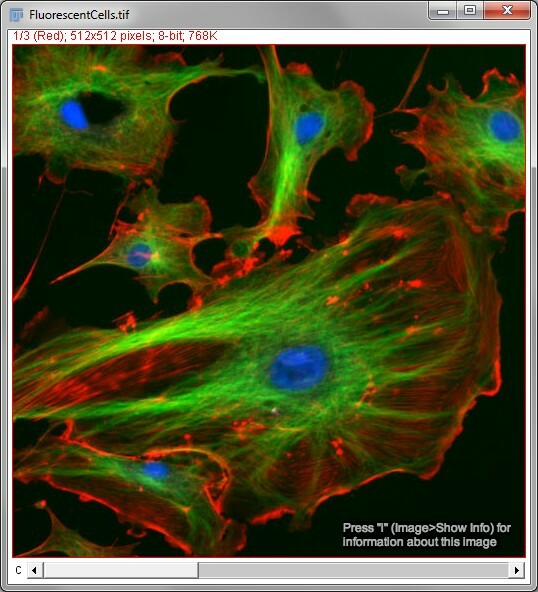 You can explore this by comparing the images Cell_composite.tif and Cell_RGB.tif. The Image ▸ Color ▸ Split Channels command should help. One way that converting an image to RGB can lose information is if the original data is 16-bit before conversion and 8-bit afterwards, causing rounding and/or clipping to occur (see Types & bit-depths). Another is that during conversion the channels have been forced to be purely red, green and blue. But perhaps they were not originally so, and separate channels have been merged into the same ones. If you had started with more than three channels, this will definitely have occurred, but even if you had fewer channels you can have problems (like in the Cell_composite.tif and Cell_RGB.tif examples). The trouble with only having an RGB image is that it is no longer possible to know for sure what the original data looked like, to be able to figure out whether anything has been lost. For example, perhaps you have managed to generate a magnificent image consisting of turquoise, yellow and dazzling pink channels. Each pixel is displayed on screen as a combination of those colors. However, precisely the same color for any pixel can also be represented – rather more simply – as a mixture of red, green and blue. So no matter what channels and colors you began with, the final result after merging can be replicated using red, green and blue channels. But if you only have the RGB version, you might never be able to extract the original 3 channels again. Their colors could be so mixed together that the original pixel values would be irretrievably lost. And so the good things about RGB images is that they look identical to the original image you had before conversion, and other software (e.g. webbrowsers or PowerPoint) can understand them effortlessly. But the potentially very bad thing about RGB images is that creating them requires conversion, and after this it might very well be impossible to regain the original pixel values. Still, there is no way of displaying a composite image that cannot be replicated by an RGB image, because the monitor itself works with RGB data (translated to red, green and blue light). Therefore for creating figures or presentations, converting data to RGB is a very good idea for the compatibility advantages it brings. In the end, it is normal to need to keep at least two versions of each dataset: one in the original (multichannel / composite) format, and one as RGB for display. This RGB image is normally created as the final step, after applying any processing or LUT adjustments to the original data. Since monitors work with RGB images, in practice what you are actually seeing on screen is always an RGB image – even when we are actually working with the data in a composite image. The RGB version is just quietly made in the background based on the composite data so that the monitor can give us something to look at. If we convert the composite image to RGB we then basically just throw away all the extra useful information the composite contained, and keep only the displayed version. However, there are more ways to represent colors than just mixtures of red, green and blue light. One familiar example is using cyan, magenta, yellow and black ink – leading to a CMYK representation of color. In practice, fewer colors can be faithfully reproduced using CMYK when compared to RGB, which is one reason why printed images often do not seem to have quite the same colors as the same images on screen. The other main color representation that turns up in ImageJ is HSB, which stands for Hue, Saturation and Brightness. An RGB image can be converted to HSB using Image ▸ Type ▸ HSB Stack. In practice, this representation can be useful for detecting features in color images that were originally RGB (e.g. 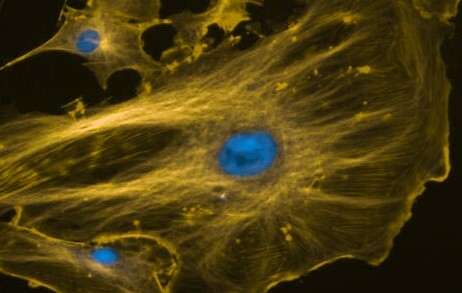 conventional photographs, or some brightfield images), but it is largely irrelevant for fluorescence microscopy. By changing the LUTs, channels can be assigned any color you like. Although red/green images are widespread, especially for colocalization, they are particularly unhelpful for colorblind people. More accessible images can be created by switching the LUTs of at least one channel to something more suitable (e.g. Red → Magenta) – although displaying both channels separately is better still. You can also test the effects of different colors using the Fiji command Image ▸ Color ▸ Simulate Color Blindness (note that this may require converting the image to RGB first). More information about generating figures with suitable colors is available at http://www.nature.com/nmeth/journal/v8/n6/full/nmeth.1618.html. ImageJ has two different copying commands, Edit ▸ Copy and Edit ▸ Copy to System. Why? Note: When investigating this, you should explore Edit ▸ Paste, alongside two commands in the File ▸ New ▸ submenu. Be on the lookout for any conversions. Edit ▸ Copy and Edit ▸ Copy to System have quite distinct purposes. The former allows you to copy part of an individual image slice (i.e. a 2D part of a particular color channel) and paste it into another image while exactly preserving the original image type and pixel values. However, this image type might well not be compatible with other software, therefore images copied in this way cannot be accessed outside ImageJ. If you want to copy an image and paste it into other software, you need Edit ▸ Copy to System. This copies the image to the system clipboard, converting it to RGB in the process, thereby preserving appearance – but not necessarily the pixel values. 1. This is the case in ImageJ, and usually (but not always) in other software. For example, it is possible for an RGB image to be 16-bit, and some contain an extra &apos;alpha&apos; channel (which relates to transparency), and so might be called ARGB or RGBA. But such images do not often occur in science. 2. This assumes fluorescence microscopy data. For an application when RGB is often suitable, see Whole slide images.